There was an excellent turnout to the Conservation Centre’s Grand Opening event Saturday the 6th. The event was a collaboration between The Comox Valley Land Trust, Tsolum River Restoration Society, The Comox Valley Conservation Strategy and Project Watershed. Representatives from each of these organizations were on hand to talk about their initiatives and to promote conservation in the Comox Valley. Visitors had the opportunity to exchange community way dollars, sign a postcard in support of the Comox Valley Conservation Strategy and take a chance on the salmon roulette wheel. Project Watershed was featuring their social enterprise,The Mapping Centre, with interactive mapping stations where you could see the Valley in 3D and have a map printed of your local watershed. There were also lots of activities in the kids zone and door prizes. The groups had a conservation gift shop set up selling art cards, t-shirts, Keeping It Living posters, the conservation calendar, and a beautiful pair of canvas photographs of swans taken by a local photographer Father Charles Brandt. Proceeds from the sale of items in the gift shop go towards protecting and restoring natural areas in the Comox Valley. 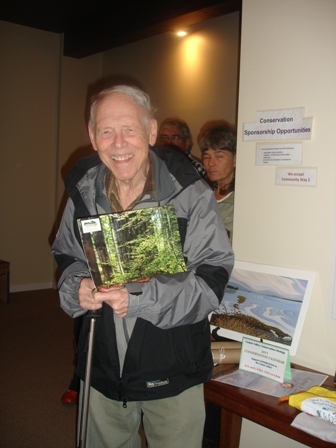 The lucky winners of our door prizes were Peter Chandle who won a conservation calendar and Carolyn Walton who won a Watersheds of the Comox Valley map. The upcoming commuter bike map that The Mapping Centre is producing together with the Broken Spoke was on display as well. The map will be available soon. If you are interested in sponsoring this map, please contact Mike Collins at the Broken Spoke – http://www.thebrokenspoke.ca – 250-871-2229. “Overall the day was a huge success with over 100 visitors taking part in our activities. We exchanged $130 of community way and sold many calendars, t-shirts and maps. We thank all of our volunteers from the four organizations who helped make such a great day possible.” says Project Watershed’s Volunteer Coordinator Valeri Diamond. Valeri Diamond’s position is funded in whole or in part through the Canada-British Columbia Labour Market Development Agreement.